So I finally get around to another post. This time it is going to be Perry plastic Austrians. I have had these since Crisis earlier this month, but unfortunately Iwas so busy at work that I never got around to write this review. But I know that these should be very interesting to people. Especially in light of the question “can I mix and match with Victrix?”. So here is the review in hopes you like it! With the box set you get a total of 48 minis. There are 42 plastic soldiers spread out over seven sprues, each containing six different minis. Also included is a six-mini command sprue. They all come with separate heads and backpacks. 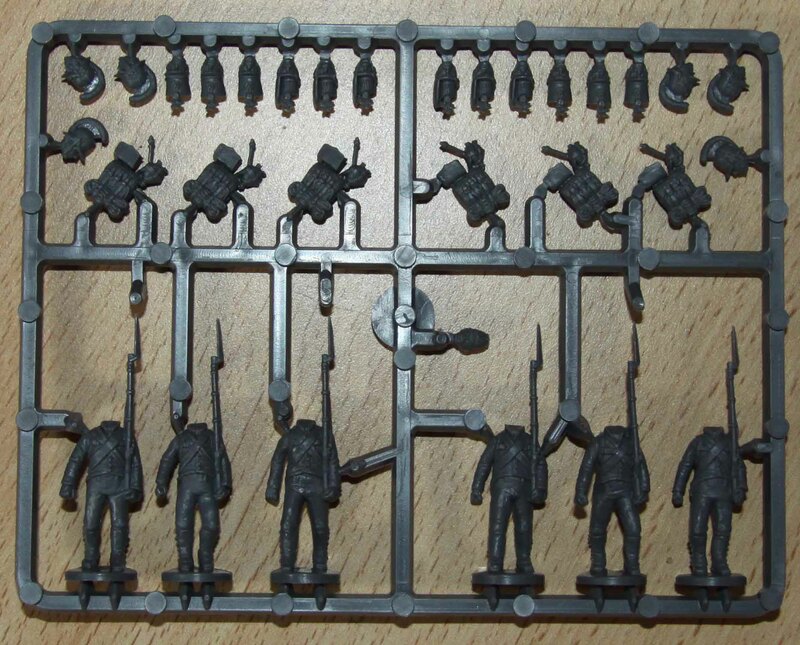 Each sprue comes with enough heads to equip all men with either the early helmet, later shako or Landwehr Korsenhut (with the exception of the officer where you a bicorne instead of the Korsenhut). The backpacks are all cast with the swords and ammo pouch hanging down from them. All uniforms are the German variety. Likes and dislikes here… The command sprue contains an officer, two NCOs, a standard-bearer, a drummer and a sapper. The later is really great, since this is one of the minis you usually do not see in a plastic set. The ratio of standard and NCOs came as a surprise to me though. If you are building one battalion from this box, then this is fine. If you are building more than one (either because your rules require less minis or you are depicting a unit that fought under-strength), you will have to get more command minis. But to be fair… this is a battalion box, so they never intended people to build two battalions with it and you can get separate plastic command sprues from the Perrys. What really confused me though is the lack of Grenadier heads! There would have been enough room on the sprue and they would not have any difference in uniform and equipment could have been solved with a hobby knife. So this is a chance missed in my opinion. 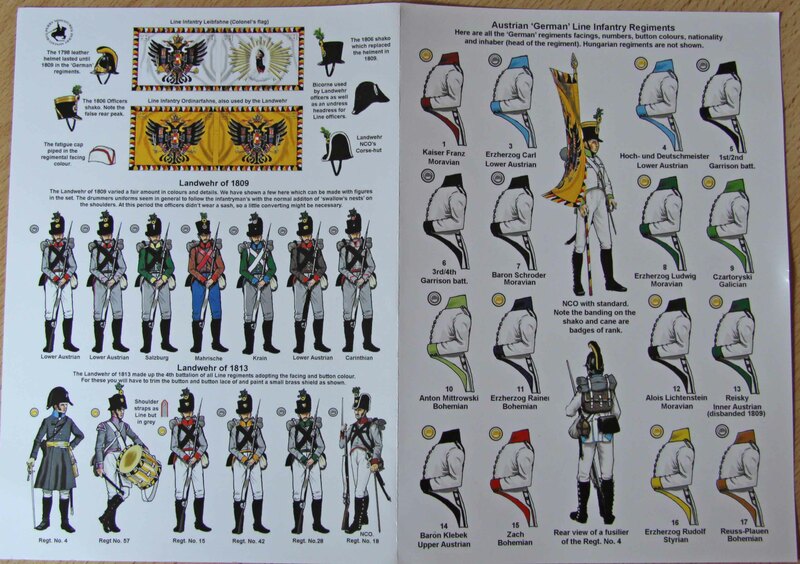 Also included in the box are the usual bases and a two-sided A5 sheet with historic uniform information (facing colours and button colours for the German infantry regiments) and two flags, the regimental and Ordinar flags. Since the sheet is printed on heavy and glossy paper one would need to photocopy the flags for use as usual. The flags are quiet nice, only the shadows are a bit strong for my taste. The quality is good enough that one does not need to use aftermarket flags. This box set retails for 18 GB£, which equals 0,38 GB£ per mini and also includes bases. By comparison the Victrix sets (a review of them can be found here by the way) cost 0,39 GB£ per mini (and include mounted officers) or in other words… virtually the same ;-). So both Perry and Victrix are the cheapest option for Austrians on the market. And they are cheaper than metals as well. For example Front Rank are 1,15 GB£ per mini (or 1,08 GB£ if part of a Battalion pack) and Foundry are 1,50 GB£ per mini. The detail is good and as crisp as usual with the Perry plastics, but not quiet up to the level of metal minis. The undercuts are minimal. There are no mould misalignments, and the casting quality is back to superb again (not the strong mouldlines, sinkholes and flesh I got with their plastic Russians). Especially this made me really happy here! I had both Front Rank and Victrix Austrians here and also used a Foundry Russian to compare them to. The style of sculpting is vastly similar with Victrix and Foundry. You can see a difference in style when compared to Front Rank though. When you compare them to the Front Rank minis, you will also find, that the Front Rank minis are taller and have a much stronger heft. I honestly would not mix these inside a unit unless you want the looks of Arnold Schwarzenegger (Front Rank) in a Kindergarten (Perry). The Perry’s are taller than Foundry minis (please bear in mind, that I only had Russians to compare them to). This is enhanced by the fact that the Perry´s have thicker bases. The heft is comparable, but the Perrys look leaner. The Perry muskets are longer and thinner as well. In the end one could mix them inside a unit, if you slip a piece of card under the Foundry minis, but they do look different enough that I would advice against it. The closest match are Victrix and Perry. The Perrys are a little taller, but well within the normal variation in a population. Since the legs on the Victrix minis are not spread as wide, their coats appear longer, but I would say that this will not stand out once painted. The muskets on the Perrys are a tiny bit longer and thicker, but otherwise the equipment is the same size. Bottom line… they are a perfect match. One thing that did strike me was the interchangeability between the Perrys and Victrix. The good thing is both companies sculpted the collars attached to the bodies, so you can swap the heads around. Since the Perrys have done the normal infantrymen with only separate heads and backpacks, one will only be able to swap a few arms on the minis found on the command sprue, but this should give you still more variety. Since the Victrix backpacks are cast with the cartridge boxes attached just like the Perrys you can swap those around as well. Again this is quiet a perfect match. Again the Perry offer all one can ask for. They are the cheapest plastic Austrians around (together with Victrix), the detail and animation are good and the castings are generally crisp. If you want to build a big Austrian army on a budged, they are a perfect choice, especially since they mix well with the other budged offering out there. So my bottom line is… they are really recommended! Well reviewed, I’m looking forward to the new ACW plastics! I have to say I still have far too many unpainted metal ACW minis lying around so they are not on my list, but I can understand the sentiment! Thank you, excellent review and interesting suggestions regarding figure swaps. I have a weakened battalion of Front Rank Austrians which I will use as heading into the “storm of hailshot” as they are advancing with muskets levelled. But for the other battalions marching in support, it has to be Perry and Victrix. 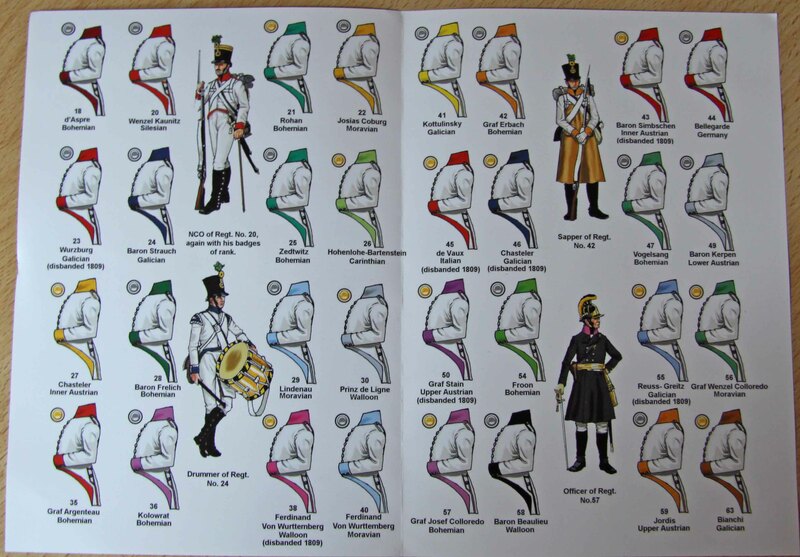 You are right… Between all the marching minis one definately needs some other poses! I think as long as they are not mixed within the same unit, or as long as the units are not touching one another mixing Peery and FR will be fine. I will definately use my FR Jäger alongside them when I find the time to start with the Austrians! A very useful review. Thanks for taking the time to post it. Just a quick word on the Foundry Austrians. They were early on in the Napoleonic releases and like the Bavarians were sculpted as 25mm minis. Later on Foundry moved to 28mm and this is the size the Napoleonic Russians were sculpted to. Hence the Foundry Russians are noticeable larger than the Foundry Austrians … at least IMHO. I can not tell how the Foundry Austrians size up (which is why I used the Russian in hopes that the average Foundry user will know how those two compare), but if they are even smaller than their Russians the size difference would be even worse and make them less compatible! 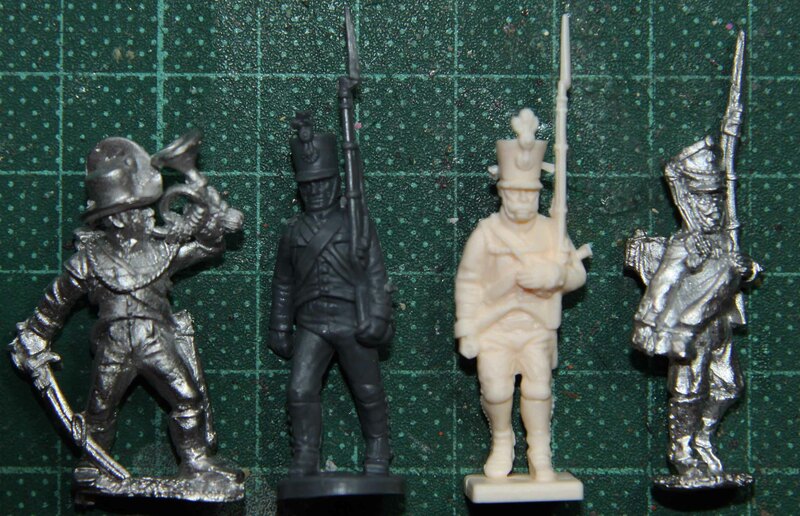 I have a bunch of the older true 25mm foundry Austrians and it is clear that the new Perry and Victrix are 28mm. The 3mm difference is exact. I would mix battalions in an army but not figures in a battalion. I was forced to in order to flesh out a unit, so i mounted a coin (US penny) under the foundry Austrian. The Foundry Austrian Cheauxleger and Perry ones were a good match. Perhaps the former is a later type 28mm as noted or early 25mm Perry. Tom, thanks for the additional info… really appreciated! Thanks for the review! Having previously owned Foundry’s Austrians, I can definitely echo that are very much like men to boys in the same way Foundry’s Prussians compare to the Perry plastics. Their heads would be about shoulder height with the new Perry stuff. Thank you for the feedback Jason! I guess together with vP’s comment this should give people a real good idea! I liked your review. Very useful, not like so many gushing Perry reviews I have seen along the way. I am also extremely glad that Victrix and perry are compatible. I really like the Victrix Austrians. I’m not so sure about different poses thou. It could end up like a box of airfix if anyone is old enough to remember. So many firing, so many marching and half a dozen doing gymnastics and the like. I might give these a go you know. Hi Lewis, glad you liked them. I can understand the general feeling about some reviews, so I always try to do them in an objective manner! And I share the sentiment about completely different poses within a set. Luckily neither Perry nor Victrix are that way with their Austrians (although I am always impressed how the later manage to have some bodies in the box that work fine for for firing/skirmishing as well). The only thing that bores me these days is, that every plastic set is marching poses! Thanks for this review, Burkhard, I wanted to know whether or not Perrys’ plastic Austrians would fit in with the Victrix sets too. I think the main reason no grenadier heads were included in this set is the obvious financial one – they want us to buy their metal ones! Even though Victrix produce a plastic set. It is my guess too that they want to “force” people to buy the metal versions. 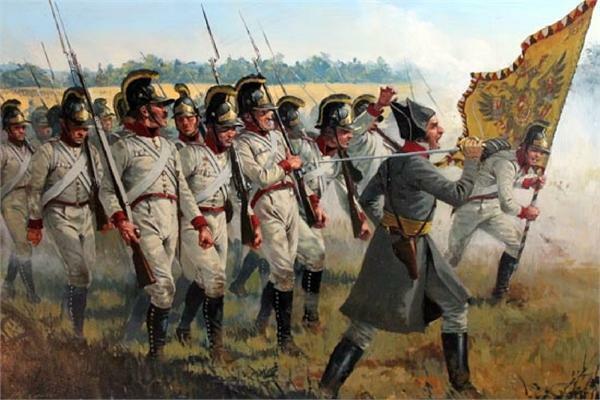 But honestly… we already need to by the Hungarian units in metal and with their Napoleonic range still having gaps all over the place, it might have been good to free those resources used by metal Grendiers. I’m irritated that like the biblical Babel , confusion has struck and I’m stuck in plaastic 20mm land assembling all the Austrians that stood at Austerlitz- because as a wee boy in rural N.Z. in the 1970’s the only thing one could buy was Airfix, so be it. The proliferation of choice means in a low population- no opponents! bugger. In a way I know what you mean. I often do not use the most mainstream minis or sets of rules, but I have found that with due time and even in an area with few players, you always end up finding someone, especially if you have enough minis to equip the players on both sides! I certainly have found the hobby an epic journey. The frustration of getting tired, of sometimes waiting for years for a manufacturer to release a particular soldier.. then finally converting them-which I’ve found is a sure sign that they will be released.. That’s what makes it all so beautifully elusive. Yes, I’ve been providing up to 2500 point armies, both sides for a few years.. Elan Deluxe rules- Anyone ever heard of that?